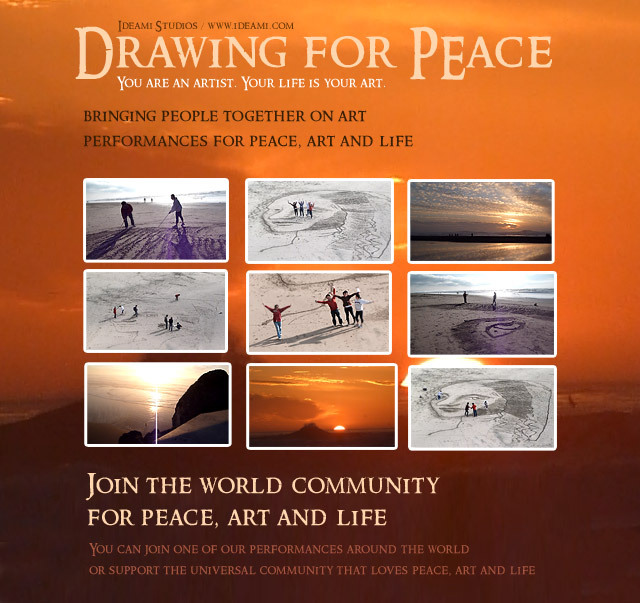 Drawing for peace is a series of art performance events organized by Javier Ideami. These events highlight an important message, the value of art as a tool to bring people together, encouraging them to collaborate in building something larger than themselves, focusing on the joy of being creative and interacting with others while staying away from conflicts. Drawing for Peace events consist of creating giant sand drawings at different beaches around the world. Participants have to work locally at different parts of the giant drawing while they maintain collaboration, cooperation and interaction with the rest of the team. They won’t be able to see the final result until their job is done. This is usually a very magical moment, when the team can contemplate the final result that was born from their individual contributions, marks and steps that have over time generated the giant drawing. An initial direction for the drawing is decided and then participants are encouraged to contribute with their own ideas, materials and variations, all within the direction and guidance of ideami in a well synchronized process that takes the team from an empty patch of sand to a finished giant drawing. One of the taglines of – drawing for peace – is : You are an artist, your life is your art. Many people think they cannot be artists because they feel they are not very creative. The reality is that the act itself of living is in itself a giant creative effort in which we face multiple obstacles that we constantly have to solve in different creative ways. Our own existence is an artistic statement, we are all artists of life. We all have the capability to use our bodies and minds to express our interpretations and views of the world and life around us. By sharing our perspectives with others, by building on each other’s art, we can achieve and create amazing things that the lone individual cannot reach. These giant sand drawings are great metaphores about how working with each other and understanding each other’s perspectives can bring us to a much larger goal that benefits everybody. Ideami has extended this concept to a new type of event called: Team Dynamics on the Sand, a series of team building events for businesses where teams explore their group dynamics as they build these giant portraits on the sand.